Possibly taking inspiration from someone else’s recent ideas, the BBC have revealed some of their plans to build up to the 2014 FIFA World Cup football tournament by showing several live international matches in the weeks before the event begins on 12 June… the unique twist being that these matches have already happened. While there are plenty of international friendly matches, tournaments, and mini-tournaments occurring in the late May/early June period as is customary prior to a FIFA World Cup, the BBC will not seek to take up any new temporary football broadcasting rights, instead sticking with one of the few they currently hold and taking advantage of an extensive archive from their FIFA World Cup vaults, in order to re-run classic matches in a way never seen before. The blend of old footage and new technology will see 5 matches scheduled for live broadcast online-only through the BBC Sport website (and all apps of the same name) to watch as though it is airing for the first time, albeit with the option of going online for additional live modern-style text updates of the action unfolding. 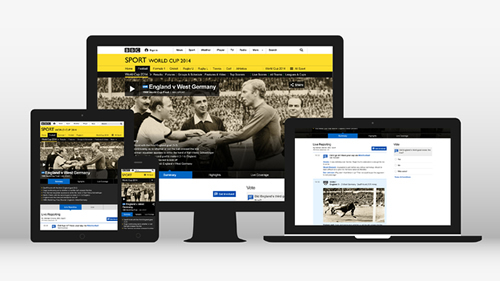 While the website is clearly set to offer the classic/modern blend above, it is unclear the video included will feature pre, mid, and post-match punditry from the presenters of the time, or if the BBC’s current selection of ‘experts’ will be on hand to provide a refreshed analysis (giving the potential of a paradox for former England international-turned BBC presenter Gary Lineker in any of his matches). Other options at present may include leaving non-match footage out entirely, or offering documentary-style feedback in intervals. For the matches to be shown, the BBC have selected 5 that are exclusively within their target market of the UK, with matches in the tournament’s history featuring England three times, and Scotland and Northern Ireland once each against different opponents, the dates of coverage spanning from 1966-1990.